The irony was not lost on me as I was driving to the Lee’s Palace concert venue that my babysitter was costing me more than what the actual concert ticket cost to see The Dead Daisies. How could that be? It seemed to me that the concert ticket prices were very reasonably priced at I believe I only paid $30 plus surcharges to see a group of The Dead Daisies‘ caliber. That feeling came back to me once again when I saw each band member of The Dead Daisies appear on stage one by one, and all I could think was “Wow. 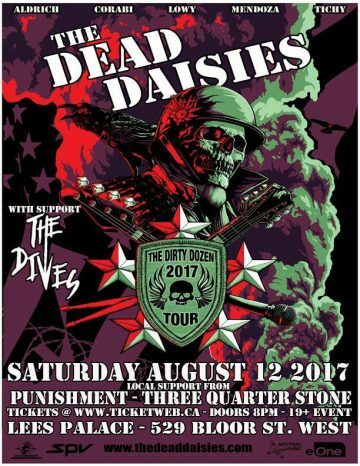 I am seeing some real professional musicians here.” I knew right then and there that I would be privy to one hell of a great show and frankly, The Dead Daisies did not disappoint. 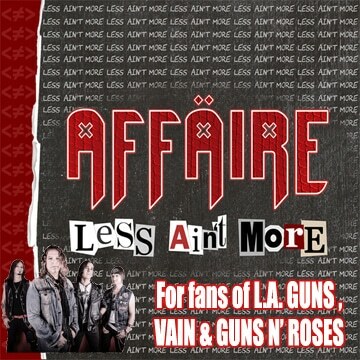 But before I get to The Dead Daisies‘ live performance at Lee’s Palace, there was one opening act that I was quite intrigued to check out although I had not heard any of their songs. KISS frontman Paul Stanley‘s son Evan Stanley was playing with his band The Dives for the first time in Toronto and I really wanted to check out Starchild Jr. to see how much of his father’s talents that he had inherited. I am going to say right off the bat that The Dives‘ music really isn’t my cup of tea and so aside from the last song that the group played, the music itself didn’t really register with me. In fact, if it wasn’t for the novelty of Stanley Jr. fronting the band, I would have likely headed to the back of the venue to chat with Decibel Geek photographer Shawn Irwin who was nestled behind the sound board closer to the back. In very similar fashion to when Irwin, a slew of other Decibel Geek writers and I attended Rock N Skull last year, I was near the front of the stage to enjoy the concert while Irwin stayed towards the back of the venue to enjoy the bands’ performances. Stanley definitely had the most stage presence out of The Dives band members as he was always moving around and generally putting on a show just like his father would of. Given my love for the band KISS, I just couldn’t help staring at Evan Stanley and looking to see what other similarities that I could find between him and his father. Truth is, had I not known in advance that Evan Stanley was the Starchild‘s son, there is no way that I would have guessed it. Evan Stanley had some beard stubble and short curly hair. The only visual similarities that I could pick out was they both kind of have the same build (when Paul Stanley was younger of course), they both sing while playing rhythm guitar and their moves on stage are somewhat similar. Of note, from the little that I heard, I have to say that Evan Stanley is already a better guitarist than his father as the audience was treated to some soaring guitar solos from Stanley Jr. throughout The Dives‘ live performance. Evan Stanley turned out to be pretty funny on stage. He advised that The Dives had some problems crossing the USA-Canada border resulting in the group not having any CDs and only one t-shirt to sell at Lee’s Palace. 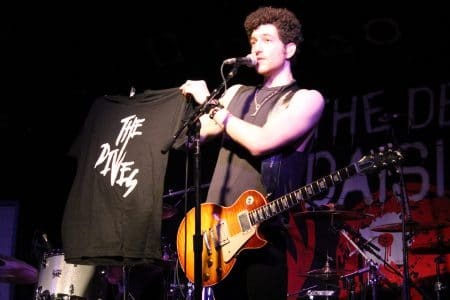 The Dives guitarist Mike Lefton ended up tossing that t-shirt (for free) into the crowd. On another occasion, Stanley Jr. was plugging The Dives‘ Facebook page and pointed out that given that it was dark in the audience, he could see if people had their phones out. He then cheekily pointed out that nobody had any of their phones out despite him asking people to go to the band’s Facebook page. He then added a comment that it “would be fun” or something like that for anyone that checked out The Dives‘ Facebook page. Clearly, I take these moments as the hallmark of a good frontman who is able to think on the fly and be funny when addressing the audience. Before long, it was time for The Dead Daisies to hit the stage. If you’ve never been to Lee’s Palace, the club has an interesting setup with the entrance and back of the venue about the same height as the stage. In between the back area and the stage is a huge kind of pit that is probably five or six feet lower than the stage. This provides just about anybody at Lee’s Palace with a pretty good vantage point of the stage. This time around, I made my way to the pit area and was probably two to three rows away from the front of the stage. I suppose that I could have squeezed my way closer to the stage but like I said, just about every spot in Lee’s Palace seemed to be pretty good to get a decent view of the stage. First on the stage was drummer Brian Tichy. 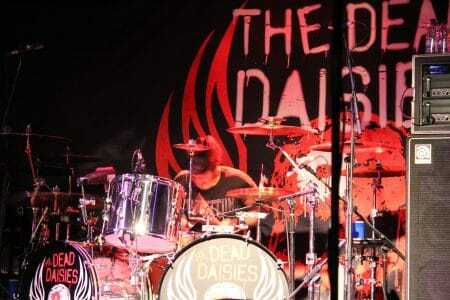 It felt like I was seeing a true professional on stage and frankly, it felt like The Dead Daisies should be playing a big arena rather than a club like Lee’s Palace. From what I understand, The Dead Daisies do have a much bigger following in Europe and possibly other countries. I suppose I should view it as a real treat that the band was playing such a small venue like Lee’s Palace in Toronto with its capacity of 550 people. While the venue definitely was quite packed with people, I wouldn’t say that it was sold out on this night. After Tichy, I believe that it was guitarist David Lowy to make his way to the stage. Interestingly, Lowy is the founder of the band but also the one who kind of lacks star power compared to his band member counterparts who have all played with bigger bands than Lowy. 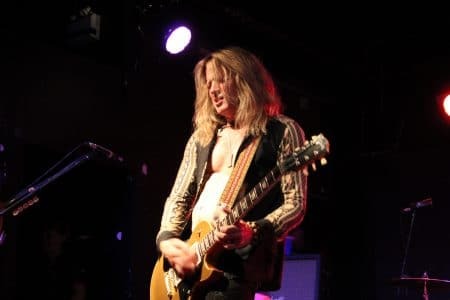 After all, Tichy, bassist Marco Mendoza and guitarist Doug Aldrich have all played with Whitesnake while singer John Corabi fronted Mötley Crüe for a while. 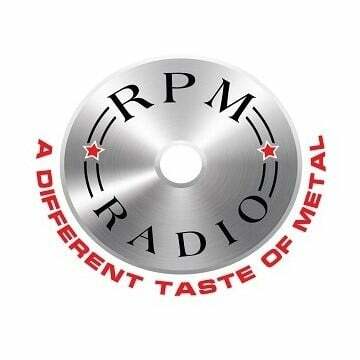 That’s what makes the current line-up of The Dead Daisies so intriguing from an organizational standpoint. 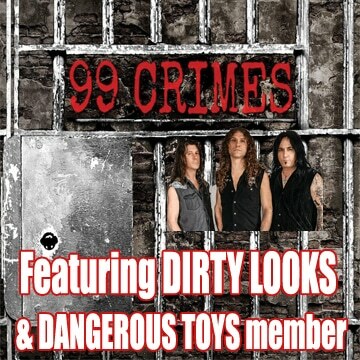 Lowy is the founder of the band and potentially the real leader of the group but it’s the “superstars” in the band — mostly Corabi and Aldrich — that seem to be handling most of the press. Next up was Aldrich who was dressed and looked like a guitar God with his blond locks, good looks, open shirt showing his six pack and one of the coolest pair of jeans that I have seen in a long time. I believe that the group launched into the first song “Long Way To Go” before the next to join the stage was Mendoza. The guy simply has monster stage presence. Funny enough, he looked so tall on stage but at one point, he walked into the crowd and then I realized that I was probably taller than he was. Finally, Corabi hit the stage and the group was off and running. Clearly, this was going to be a fun night. Aldrich, Lowy and in particular Mendoza took great care to throw guitar picks to specific people in the audience. Mendoza must have tossed over 50 guitar picks into the audience throughout the night. One of Mendoza‘s guitar picks landed near my feet so yours truly had one leaving the show, which my four year old daughter (I had promised to give her a guitar pick if I obtained one at the show) lost or more like placed into an impossible to retrieve spot within ten minutes of obtaining it. Grrrr. One of my other daughters also lost my Autograph guitar pick… I’ll know better for next time. The Dead Daisies performing “Long Way To Go” and “Mexico” live at Lee’s Palace in Toronto on Sat August 12, 2017. As Corabi started addressing the audience, he was quick to point out how great it was to be in Toronto during the summer for once. 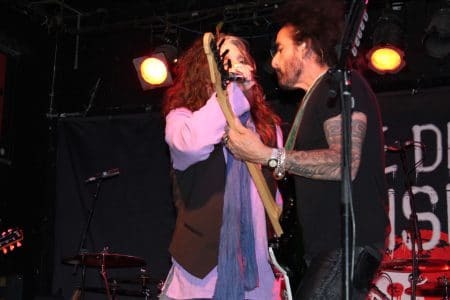 For some unknown reason, Corabi has a tendency to play his solo shows in Toronto during the winter months and he always seems to attract bad winter weather when he does. Corabi was his usual witty self. At one point, he asked the audience how many people had picked up The Dead Daisies‘ last studio album Make Some Noise before repeating the question but this time in terms of the band’s latest album Live & Louder. After seeing the show of hands for both albums, Corabi proclaimed to the crowd and his band members that he would be able to feed his dogs for three more days or something like that. What I was most impressed about this evening was that The Dead Daisies played a whopping nine songs from their latest studio album Make Some Noise. You’d be hard pressed to find any band doing that which already has three albums under its belt. 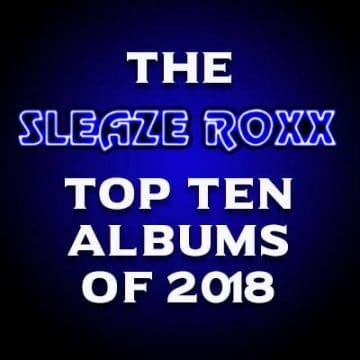 However, that’s not surprising when a group delivers a top notch album like Make Some Noise, which after all landed at #8 on the Sleaze Roxx’s Top Ten Albums of 2016, and frankly is way better than the group’s previous efforts. I had yet to pick up the group’s live album Live & Louder by the time I attended the concert but did pick up a physical copy on my way out of the venue after the show. What I didn’t realize is that The Dead Daisies‘ show on this night was pretty much a replica of what they were doing on Live & Louder, which is definitely not a bad thing. The Dead Daisies put on an energetic show filled with great songs. My personal favorites on this night were the crowd sing along anthem “Make Some Noise” (which was surprisingly played as the third track of the night), “We All Fall Down” and the hard driving “Mainline.” There really wasn’t one song that I felt that the band should have omitted from its set on this night. The one part that I was a bit ambivalent to was Tichy‘s drum solo. That being said, it was certainly really cool to see how fast that Tichy‘s hands were and funny to see him throw some of his drumsticks in the air but have them hit the ceiling before he caught them on the way down. Clearly, the man is used to playing at bigger venues with higher ceilings! Tichy was also impressive during the part of his drum solo where he used his hands rather than drumsticks. So in some ways, it was great to see Tichy‘s drum solo but I would have still preferred to see The Dead Daisies play an extra song instead. One thing about The Dead Daisies is that they play quite a few covers. There is no question that they made them their own and it was interesting hearing Corabi sing The Beatles‘ classic “Helter Skelter” considering that the song had been on Mötley Crüe‘s 1983 released album Shout At The Devil (and sung by Vince Neil). Nevertheless, playing four covers — “Fortunate Son,” “Join Together,” “Helter Skelter” and “We’re An American Band” with the various snippets of classics during the band intros seemed to be a bit too many covers for musicians of this caliber. In any case, the covers flowed nicely with The Dead Daisies‘ original material so take it as just a minor complaint or observation from my part. I should add that the band introductions with snippets of great songs such as AC/DC‘s “Dirty Deeds Done Dirt Cheap” and Black Sabbath‘s “Heaven And Hell” were quite entertaining and fun. It was also cool hearing Corabi kidding around while praising each of his bandmates during the intros. Overall, The Dead Daisies put on a great fun filled show and I can’t wait to see them again. I count myself lucky to have seen them play at such a small venue like Lee’s Palace. Of note, I didn’t keep track of the setlist played on this night but it looks awfully similar to the setlist played by the band two nights earlier in St. Charles, Illinois, USA and that was reviewed by Sleaze Roxx.